Restricting the number of fast-food outlets around offices and homes could help combat the obesity epidemic, UK researchers say. Exposure to too many pizza and fried-food outlets can nearly double your chances of obesity, research suggests. Measures to restrict access, such as not opening takeaway restaurants near schools, may help, scientists report in the BMJ. Others argue that policymakers should focus on making fast food more healthy. The evidence comes from a study tracking more than 5,000 adults born in Cambridgeshire between 1950 and 1975. Epidemiologists at Cambridge University looked at workers' consumption of takeaway food - including hamburgers, pizza, fried food and chips - at home, work and on their commute. As far as possible, they allowed for factors known to influence obesity, such as education, income and smoking. They found that greater access to takeaway food was linked with higher body mass index and higher odds of obesity. Dr Thomas Burgoine, who led the study, told BBC News: "Those most exposed to takeaway food outlets overall were nearly twice as likely to be obese, compared to those least exposed." Several local authorities have introduced restrictions on fast-food outlets, around schools or in places where there are already lots of takeaways. "Our research suggests that policies to make our neighbourhood more healthy by restricting access to takeaway food might be successful," said Dr Burgoine. 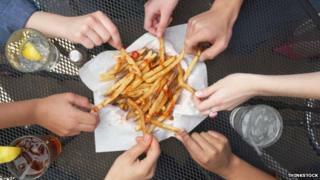 However, research in the US has produced conflicting results on the link between fast-food exposure and obesity. Dr Kathryn Neckerman, of Columbia University, New York, said her research on schoolchildren indicated children in neighbourhoods with a lot of fast-food restaurants were slimmer. "Instead of restricting takeaway food, we should seek to transform it," she told the BMJ. "Healthy takeaway food should not only be available, it should be as visible, tasty, and cheap as unhealthy food." She added: "It is difficult now to imagine a world in which broccoli rivals chips at the takeaway counter, but small steps in this direction are already being taken." In the past decade in the UK, spending on food eaten outside the home has increased by 29%. According to the study, the average person encounters 32 takeaway restaurants around their home, workplace and travelling between the two. Tracy Parker, heart health dietician at the British Heart Foundation, which helped fund the study, said: "We already know that people are spending more than ever on takeaways and food eaten away from home, and that these foods are often less healthy than the meals we make ourselves. "This is a worrying trend given that a quarter of adults in the UK are already obese, putting them at greater risk of heart disease. "While this study can't prove someone's local environment can cause them to become obese, it's vital we have the tools to make healthy choices when eating takeaways or food in a restaurant."